Today, I share one of my favorite dishes - Aloo Paratha. 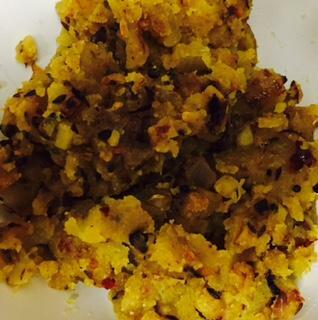 It is a dish of mashed potato stuffed bread from the Northern India. It is my favorite breakfast dish when I am in India. Here is my try in making some edible parathas. 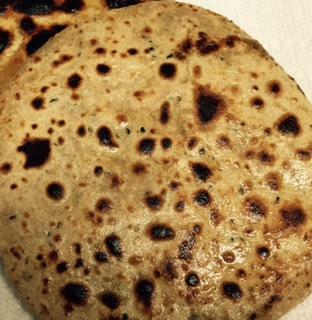 It might take few trials in making a perfectly round-shaped Paratha. Please share your views and inputs in comments below. Mash boiled Potatoes and mix salt and chili flakes. In a skillet heat oil and add Garam Masala. Once it start to sputter, add cut onions. Add rest of spices and fry until golden brown. Add mashed Potatoes mix and fry for another 2-3 minutes. 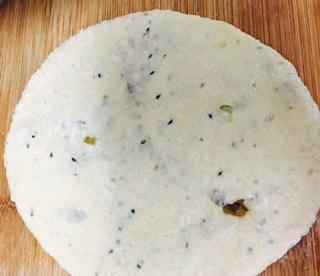 Knead flour with Ajwain, Kalaunji and salt. Make craters in the balls and fill them with the stuffing. Roll these into flat circular breads, typical Indian Bread shape. Heat these slowly on a skillet on each side. Once almost cooked, apply some butter or Ghee. Let it cool before serving. It can be served with Indian spicy pickle and yogurt (Dahi).